ITIL® is the most widely accepted and used set of practices for service management in the world. It is designed for organizations that want to improve their activity in the field of customer-focused service, and provides real benefits to real businesses. ITIL® has become more relevant than ever, especially with regard to the cooperation between the private and the public sector. Furthermore, the method is supported by a wide range of publications, consultancies, software tools, and can be adapted to meets any business’ needs. 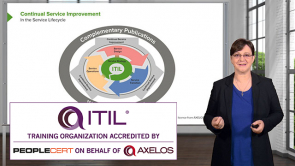 This course offers the best introduction to the ITIL® framework and is ideal for those who want to improve their career opportunities by obtaining a worldwide recognized IT-certification. The series of lectures cover the description and definition of service management, and provide insight into the service lifecycle and how this aspect helps IT to deliver services to businesses. * Discounts and special offers do not apply to this course.